Inside: 5 Comprehensible Input Activities to try to engage students. Try one out this week to incorporate something new to spice up the end of the school year. It does not matter if you are new to CI or have been doing it a while, these could work for any Spanish or World Language Class. Hi friends! 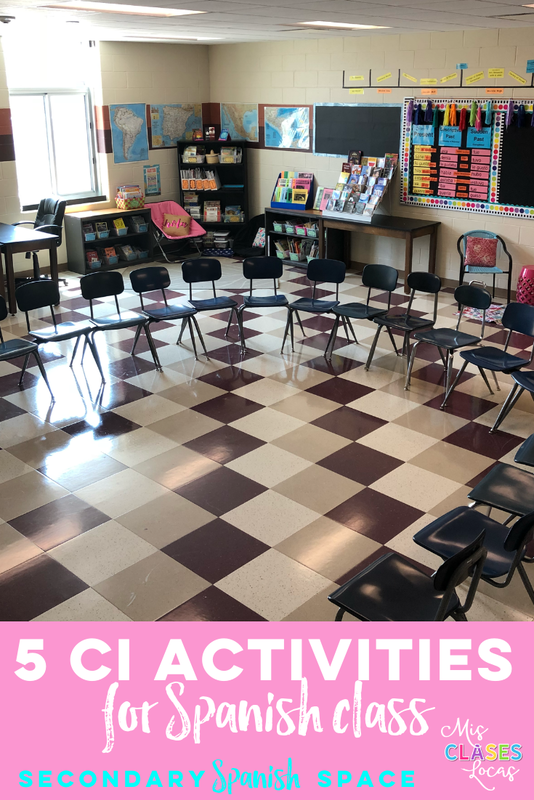 It is Allison and here are some ways I incorporate comprehensible input based activities in my deskless Spanish classes. The idea of interviewing students in class is from Bryce Hedstrom. I personally tried it out multiple times semi unsuccessfully until I hit my stride using special person interviews with high frequency verb units. Below is what I have found works best with my own secondary classes. The special person is asked personalized question using that target structure in a slide show. This support for both teachers and students was a game changer for me while doing the interviews. I use my clicker, which prompts their first person answer. The the class chorally states the information back. We circle the information until we feel comfortable to move on. The rest of the students sit in a semi circle without anything on their laps. They do not take notes during and their job is to listen to understand and interact. I jot down notes on the whiteboard as we go. (Or you could have this as a student job). Once we are done interviewing, we give the student a positive validation and do a brain break. Then my students grab their guided notes sheet and a clipboard and take down the notes over our special person that are written on the board. Or you could have students work alone, in pairs or in small groups to take down notes open ended style as more of a free write. In all of my classes we typically start Mondays with a "Weekend Talk" or "Weekend Chat." Spending a few minutes casually chatting in Spanish about the weekend makes class interesting and relevant. It shows you care about your students as people. 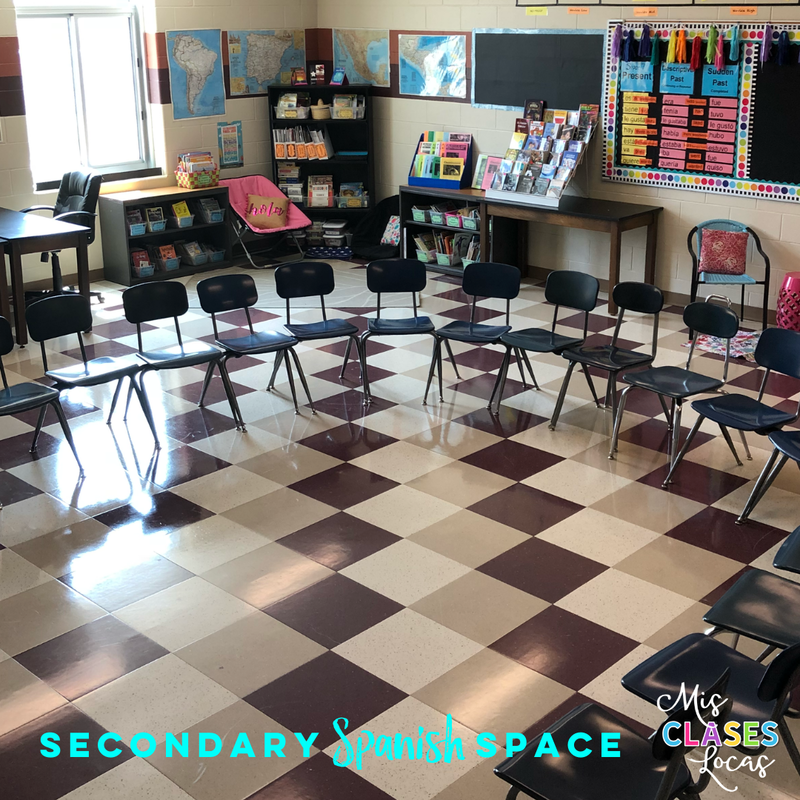 This check in also gives a teacher SO MUCH information of how to adapt class, personalize to makes things relevant, and to build a positive classroom community. As an added bonus it is a sneaky way to get in repetitions of high frequency words in the preterite or completed past tense. As with anything variety is the spice of life, so I like to mix up how we weekend chat. This Weekend Chat resource is my ready to go slide show of ideas to project and go Monday morning. I also have a Weekend Chat Find Someone Who that I like to have printed and ready to go for a no prep activity for any level any Monday. For even more ideas check out the blog post 5 Ways to mix up Weekend Talk. Movie Talk is a technique for language learning developed by Dr. Ashley Hastings. Basically, the quick summary is: Movie Talk is a activity for a CI classroom involving playing a short, muted video clip, while the teacher explains it in COMPREHENSIBLE language. The teacher frequently pauses the video clip, asking questions, which circle and repeat the target structures. The goal is not to narrate everything happening, but instead focus on comprehensible language that narrows in on the structures that the teacher wishes to emphasize. I personally prefer to use screenshots in a slide show to narrate the story in advance. I often to do not even tell students that what I am showing them is actually a music video, short film, movie or TV show. After discussing the story, personalizing it for students, and maybe even doing a reading or other activities, then we watch the actual video with sound. You can make an entire week or more unit just using one video if you include pre-watching input and post watching activities and extension. If you want to dig deeper, here are a few more resources on the Movie Talk technique my post on movie talk , Movie Talk - History, Movie Talk by Haiyun Lu & Movie Talk by Martina Bex. A core component of my comprehensible input focused classes is reading. We free read at least two times a week from my Class Library. This time has very little accountability for us and is just about enjoying and reading comprehensible readers. Sometimes we do a little chat with a partner or quick reflection after finishing a book, but it is all to build enjoyment of books. I also center my curriculum on Class Novels. This post on teaching a novel 101 gives a lot more information of how I do this. I also have over 80 posts with the label novels on Mis Clases Locas with specific in depth information on particular novels. A typical day teaching a novel in Spanish class gives you a look at what I often do day to day and 20 Activities that can be used with any novel shows how you can mix it up. At this point in the school year I think most of us are drowning in state testing, it is getting nice outside and everyone is a little antsy. I am personally trying to incorporate a lot Movement in my classes. This means Brain Breaks, Review Games and as many input heavy games for Spanish class as possible. There are so many games out there, so I think the key is mixing it up to keep students on their toes. At the same time many games can be reused with new content to keep them fresh. Some games that I often come back about once per novel are running dictation, The Marker Game and GimKit. A new one that I just tried as a part of game stations and my students loved was the meme game. You can also pretty much turn anything into a game by calling it one, getting out whiteboards or involving a ball. Here's to a great end the school year friends! We can do it!